100% Commercial-Grade Titanium Heat Exchanger with a LIFETIME Warranty on the Heat Exchanger, and No Chemical Exclusions. AUTOMATED SELF DIAGNOSTIC SYSTEM allows You to Pinpoint the Issue with Onscreen Preprogrammed Codes. Perfect Size for Pools Up to 28,000 Gallons. Super Silent Scroll Compressor with Virtually Silent Performance. UV and Corrosion-Resistant Housing for Durability From Weather Conditions and Pool Elements. Reliable PVC Fittings For Ease of Installation. AWARD-WINNING CUSTOMER SERVICE TEAM to Support You First-Hand. 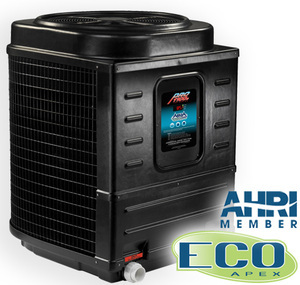 Dimensions: Width- 33" Depth-36" Height- 45"
5 Year Warranty on the Heat Exchanger. 2 year Warranty on all other components.